Star Anise Kitchen starts attending the market this week. Star Anise offers a variety of South Asian influenced dishes. Peter Fung always has a vegan/vegetarian option and often has a gluten-free option as well. He dropped off samples a few weeks back and they disappeared in no time. Star Anise, like Savory et Sweet, has a market-based seasonal menu which changes every week. I can’t believe I am making this statement in mid-November but there might still be corn available tomorrow. Several farms had corn at the weekend markets, including Greenville Farm. It looked good and tasted good. Greenville is going out again today to harvest. With luck, Sid and Louann will have corn tomorrow. They will have peppers, winter squash, pinto beans (adzuki should be ready soon), prunes, eggs and hazelnuts too. 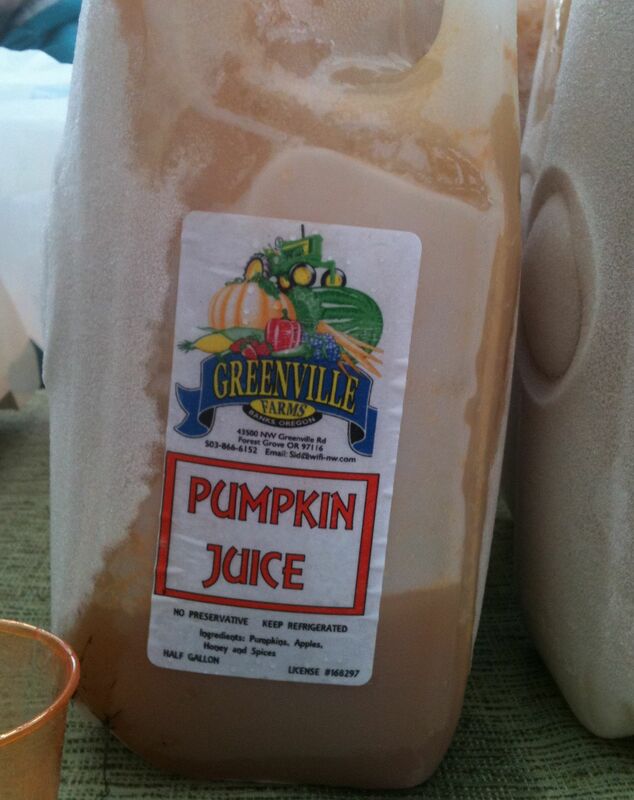 Greenville also has a new product – pumpkin juice. Harry Potter jokes aside, it’s pretty good. Rick Steffen Farm will be bringing a rainbow of peppers, sweet potatoes, onions, potatoes, green beans, spinach, chard and other vegetables. They will also have pepper bouquets and harvest wreaths. Nature’s Choice will have maitake, shiitake, and chanterelle mushrooms. With luck, there may be other wild mushrooms as well. Bill will also have a good selection of dried mushrooms and honey too. With luck there may be some rose hips, wild watercress and wild chestnuts too. Olympic Provisions is out this week. Rick Steffen Farm: Tomatoes (maybe), chard, onions, potatoes, carrots, green beans, eggplants (maybe), peppers, spinach, strawberries (maybe), dried pepper bouquets, harvest wreaths. Greenville Farms – prunes (fresh and dried), tomatillos, peppers (jalapeño, poblano, anaheim and more), corn (maybe), hazelnuts, eggs, and jams, mini-pumpkins, pumpkins, pumpkin juice. Nature’s Choice – fresh mushrooms (shiitake, maitake, chanterelle, matsutake (maybe)), dried mushrooms, mushroom salt, honey, huckleberry jam, sprouts – Lentil sprouts, Sprouted Red Winter Wheat, Yuletide (aduki, mung, pea), San Francisco Blend (Peanuts, Mung, Adzuki, Black, Crimson, Eston, French Blue & Green Lentils, Green, Speckled & Bill Jump Peas, Black, Brown & Beige Garbanzos). Fressen Artisan Bakery – pretzels, German and Austrian breads and pastries including stollen.